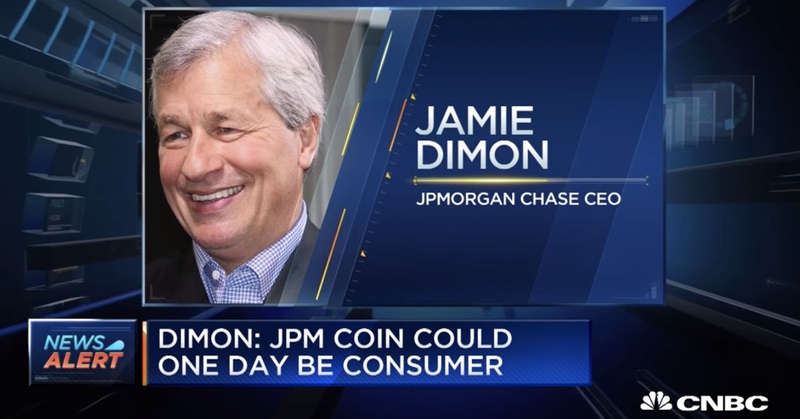 It is sad and funny at the same time: after bashing Bitcoin again and again, Jamie Dimon now believes that JPM Coin could ‘one day’ see consumer use. Jamie Dimon, Chairman and CEO of JPMorgan Chase, called Bitcoin a “scam” multiple times and said he had “no interest” in it. Now, a year later, JP Morgan is launching an own cryptocurrency that according to Jamie Dimon could see consumer use in the future. It is ironic how fast things can change: at the end of 2017, Jamie Dimon still said that “if you’re stupid enough to buy bitcoin, you’ll pay the price one day.” In 2019, JPMorgan Chase launches something similar to Bitcoin that can also see consumer use. After JPMorgan Chase revealed the existence of JPM Coin a few weeks ago, Umar Farooq, Head of Blockchain Initiatives, described three applications, all internal: replace wire transfers for international payments by large corporate clients; provide instant settlement for securities issuances; and replace U.S. dollars held by subsidiaries of major corporations using JPMorgan’s treasury services. Looking at the information above, it seems that JPMorgan Chase is trying to do exactly the same as Bitcoin. Bitcoin, the cryptocurrency that JPMorgan Chase bashed for so many years. Therefore, people should not see JPM Coin as a threat, but as an acknowledgement that big institutions are threatened by Bitcoin and other digital assets.